Empty nesters who are thinking they have too much house are finding it isn't all that easy to move to a smaller place. Lynn Cordova of Apple Valley knows that. 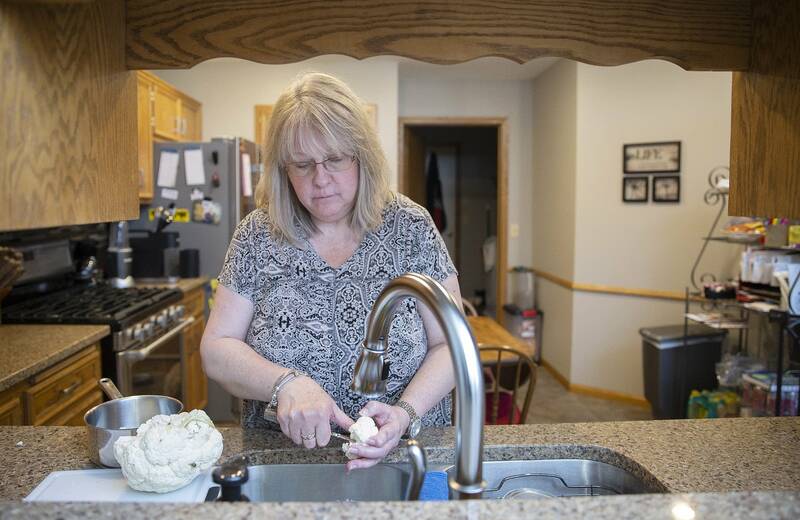 About a year ago, she was looking ahead to being alone in her four-bedroom, three-bath house in Eagan. "It was a little more house [than I needed]. Too many stairs, just a lot going on, trying to take care of the yard, trying to shovel the driveway, things like that," she said. Cordova ended up moving to a two-bedroom single-level town home in Apple Valley. But the hunt for a new place took almost a year because there was so much competition. Single-level homes and town homes that were interesting to Cordova drew buyers immediately. "They were sold before I even got in the door," she said. Lora Krall and her husband would like to downsize, too. The Winona, Minn., couple expects their two-story, three-bedroom Cape Cod will be too much for them to handle before long. But they're having sticker shock. "To move to a small town house is actually twice what our house payment is," Lora Krall said. There are some senior living apartments. But Krall said her impression is that's not good fit for her and her husband. "They're not designed for people who are still mobile and active and may be working," she said. "I don't want to be disrespectful, but I don't want to live with people that all have gray hair and are talking about things they used to do," she said. Krall said they may just remodel their house so they can live just on the first floor and stay there longer. Downsizing is a complex decision, involving not just the real estate market, of course, but also finances, emotions, health and life expectations. "The housing decision is a challenging nut to crack," said Jean Wolfe, a financial adviser with Robert W. Baird. "Indecision seems to paralyze mostly everyone." Wolfe encourages clients to consider how much of their assets and income they want to go toward housing and maintenance. And she prods them to figure out what kind of home will best fit their lifestyle, care needs and any physical limitations. Wolfe said that's a lot to contemplate, along with the difficulty of cutting decades-long ties to a home and neighborhood. And sometimes couples split on the downsizing decision. One wants to go; the other wants to stay. "If people can envision themselves moving they likely will do it," Wolfe said. "If they don't envision themselves moving, it will be a much more challenging issue." She said a lot of people contemplating a move are frustrated by the lack of housing choices and surprised by high prices. With the market tight, more elders are remaining homeowners. A Boston College study last year found 8 in 10 people aged 80 to 84 are homeowners — up by nearly one-fifth since 1980. University of Wisconsin professor Michael Collins, who worked on the study, said more older homeowners may feel they can still handle a larger home. "One thing we have to remember is that today's seniors are healthier," Collins said. "They're better educated. They're wealthier. They're living longer and are much more active." Collins said that if seniors do move, it's likely to another house, not an apartment. And that house may be bigger and come with a mortgage. Collins said that about 40 percent of homeowners near age 70 have mortgages. Older house hunters are finding prices high because the supply of homes for sale is below historic averages. That's true for both new home construction and existing homes for sale. Last year, about 76,000 Twin Cities homes were up for sale. In 2006, about 110,000 were put on the market. And there's a significant shortage of what many downsizing boomers really want: town homes offering single-level living. "Town homes are the most under-supplied segment relative to the demand," said David Arbit, research director for the Minneapolis Area Association of Realtors. "We need more town homes to be built." And smaller homes under 2,000 square feet, which first-time homebuyers and many downsizers covet, have seen above-average price increases. They also sell quicker. And sellers get a bigger share of their list price than other home sellers do. In addition, there has not been much construction of market-rate apartments aimed at the 55-plus crowd who want to live independently. Only about 400 such apartments were built in the Twin Cities metro area between 2014 and 2018, according to Jay Thompson of Viewpoint Consulting Group, which tracks the senior housing market. About 6,500 assisted-living units were built during that stretch. But those apartments typically target people 80 years of age or older, Thompson said. Right now, the country's housing stock is not well-aligned with its demographics and what many people want. "We just simply need more housing options besides the single-family house," said Jennifer Molinsky, senior research associate at the Joint Center for Housing Studies of Harvard University. Molinsky manages the Center's work on housing for older adults. Her shopping list includes more smaller, easier-to-manage and to-navigate condominiums or apartments within largely single-family neighborhoods. "These things could make a difference but are, at this point, not plentiful enough," Molinsky said. Lynn Cordova's move proved to be well-timed. Shortly after she'd settled into her single-story town home, she broke her ankle. But, she didn't have to climb stairs and her scooter took her wherever she needed to be. Cordova has a couple of pieces of advice for people contemplating a move to a smaller space. "Do it as early as you can, if you're planning on it — 50s or 60s, while you still have your health," she said. But first, "start getting rid of things," she said.